Normandin Mercier offer two products labelled “Extra”, one being distilled from grapes exclusively from Grande Champagne in Cognac and the other being distilled from grapes exclusively from Petite Champagne in Cognac. 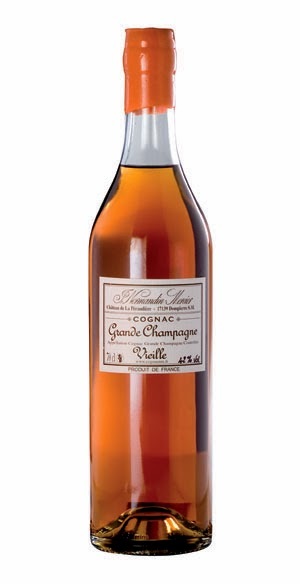 The difference in the two products can be the result of many things including distillation, vintage and maturation in the wood but many accept that the terrain of Grande Champagne – with its chalky soil – is the jewel in the Cognac crown closely followed by Petite Champagne. The difference between the Grande Champagne and the Petite Champagne is significant – the Grande Champagne offers a lighter experience with flavours more integrated with sweet floral and fruit notes dominating with surges of aggression, while the Petite Champagne offers a heavier experience with the vanillas, caramels and wood notes dominating. Nose: The herbaceous sweet perfume of mellow floral notes intermingles with more sugary fruit notes of ripe fig, apricot, banana and dates. Sharp astringent surges of polished wood and leather add some much needed aggression with tart green mango and tangy passion fruit developing with spicy toffee, cinnamon and candied ginger, and they cut through the fog of sweetness that opens up with a complex array of nuts (almond and walnuts) while sweet flowery gusts of near perfection return with a citrus blossom twist. The wood notes are certainly there, but with less impact than in the Petite Champagne. The Grande Champagne offers a softer experience with more finesse floral and fruit notes while the Petite Champagne is denser and richer with more vanillas, caramels and wood notes. Taste: The gentle embrace of ripe fresh fruit in the form of fig and peaches wash against the palate with gentle vanillas and buttered raisin packed scones, as the sweetness intensifies into dried fruit and mixed nuts as the bitter dark chocolate and rich leather notes act as a counterbalance to the sweetness which recedes into toffee. This is beautifully balanced, and this cognac does not step one foot wrong the entire time. Finish: Dark chocolate coated raisins and the taste of a cigar box lingers (the tobacco, paper and dry wood notes) as leather develops towards the end with crushed coffee bean and cocoa dusted orange layered with herbaceous manuka honey – the sweetness has herbal notes.